Most surgeons use silicone breast implants, which provide a more natural look and feel than saline implants. Saline implants are sometimes perceived as being safer, although exhaustive studies have validated the safety and reliability of modern silicone implants. On average, silicone implants cost twice as much as saline implants. Saline implants consist of a silicone shell that is filled with a sterile saltwater solution after it is inserted. In some cases the volume of saline implants can be adjusted through a special port. Most women who opt for saline implants do so either due to cost (saline implants are less expensive than their silicone counterparts) or because they are uncomfortable with the potential risk of silicone leaking into the body should a silicone gel-filled implant rupture. Saline implants are FDA-approved for women ages 18 and older. Most plastic surgeons agree that saline implants look and feel less natural than silicone implants. The implant can be somewhat hard once filled with the saline solution, whereas implants with silicone gel filling resemble the feel of a natural breast. However, some plastic surgeons believe that a new type of saline implant called the Ideal Implant could be a game changer. Approved by the FDA in 2015, the Ideal Implant has a different internal structure that makes the saline filling act similarly to silicone, resulting in a more natural look and feel than traditional saline-filled implants. While both saline and silicone breast implants are safe and durable, some women opt for saline implants because if they do rupture, the saltwater filling can be absorbed by the body. Not all plastic surgeons agree. Another expert we spoke with, Eggleston, Colorado plastic surgeon Greg Buford, MD, doesn’t see this as a big factor. “This advantage doesn’t hold very much weight since the overwhelming science behind silicone gel implants has proven them to be safe,” he says. The average surgeon’s fee for breast augmentation in 2016 was $3,719, according to the American Society of Plastic Surgeons. This does not include fees for anesthesia, materials (bandages, stitches, etc.) or medical facilities. The cost of breast augmentation varies markedly depending on many factors, including the implant type but also your geographic location, the experience and reputation of your surgeon, and other factors. That being said, it is safe to say that saline implants themselves are less expensive than silicone gel-filled implants, coming in at about half the cost. Like saline implants, silicone gel implants have a silicone shell. However, unlike saline implants, silicone implants are filled with silicone gel, which is more viscous than saline. Different silicone implants have different levels of cohesiveness (firmness). The less cohesive the gel, the softer the implant. Implants with a higher-viscosity gel are firmer and maintain their shape more. Most women who have breast augmentation choose silicone gel-filled implants because they provide more natural results. Silicone gel implants are FDA-approved for women ages 22 and older. Surgeons generally agree that silicone implants feel more natural than saline implants. “Most patients choose silicone because they want a more natural-feeling implant. The better one is the one that makes the patient feel most comfortable,” says Chen. Despite what you may have heard in the media, silicone breast implants have proven to be safe in numerous studies conducted over many years. However, a newer-generation silicone gel implant largely eliminates this issue. Affectionately referred to as “gummy bear implants” due to their consistency, highly cohesive silicone gel implants are firmer than traditional silicone implants and therefore do not ooze if they rupture. As mentioned above, silicone gel-filled breast implants cost about twice as much as saline-filled implants, but the overall price of the procedure varies widely based on where you have the procedure performed, the experience of your surgeon, and other factors. Most aspects of the breast augmentation procedure are the same whether you have saline or silicone implants placed. In both cases, the implant is inserted via an incision made in the armpit, around the areola or in the natural crease below the breast (the inframammary crease). However, the placement of the implant can differ, and sometimes the type of implant plays a role in this decision. Submuscular placement means that the implant is placed partially beneath the pectoralis muscle, while subglandular placement places the implant between the chest muscle and the breast tissue. Many plastic surgeons strongly recommend silicone gel implants to patients interested in subglandular placement, because they are more likely to produce a natural look and feel. Both saline and silicone implants can be very effective options. One advantage of saline implants is that they can be better fine-tuned to help address minor size differences between the two breasts, since they are filled during surgery. But Buford says this advantage doesn’t hold up very well because most silicone implants have differential size ranges which allow for fine tuning — just not to the same degree as saline implants. The experts we spoke with also pointed out that breast implants — saline and silicone alike — are not permanent devices and will need to be replaced at some point. Buford concurs, but is adamant that breast implants do not need to be replaced every 10 years — an idea he sees as a common misconception. Either way, it is extremely important that your decision regarding the implant type be based on your individual needs. Prepare a list of any questions you have and bring it to your initial consultation with your plastic surgeon. He or she should be willing and able to walk through every aspect of the implants and the procedure, and answer any questions you may have. While fat transfer breast augmentation causes little to no scarring, breast implant surgery leaves scars that take several months to fade away. Fortunately, there are a number of products that can help minimize their appearance and speed up the healing process. Users report that these transparent gel sheets are more comfortable and adhesive than other popular brands. ScarOut! 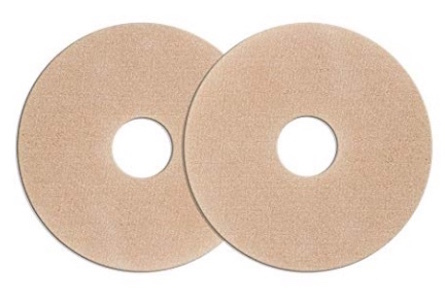 is perfect for those tricky areas along the breast fold, and comes with zinc oxide tape to help secure the sheets in place. This gel can be applied anywhere on the body and goes on completely clear — it can even be worn under makeup. 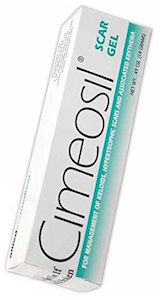 Cimeosil’s medical-grade silicone must be applied twice a day to reduce the appearance of scars. 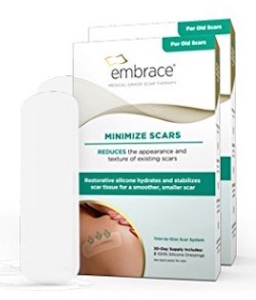 Embrace Scar Treatment sheets use medical grade silicone to hydrate and fade scars. It’s a good option if you’re a low-maintenance type of person, as it only has to be applied every ten days. If you’re looking for an alternative to sheets or gels, this silicone stick is hard to beat in terms of portability and ease-of-use. Pro-Sil Silicone Stick is highly effective at diminishing scars — even those with abnormal shapes that sheets sometimes cannot accommodate. While the price of this single gel sheet is a little steep, it’s your best bet if you’re concerned about hypertrophic scarring. Washable, reusable, and thicker than other scar sheets, Cica-Care is a medical-grade treatment for more prominent scarring.